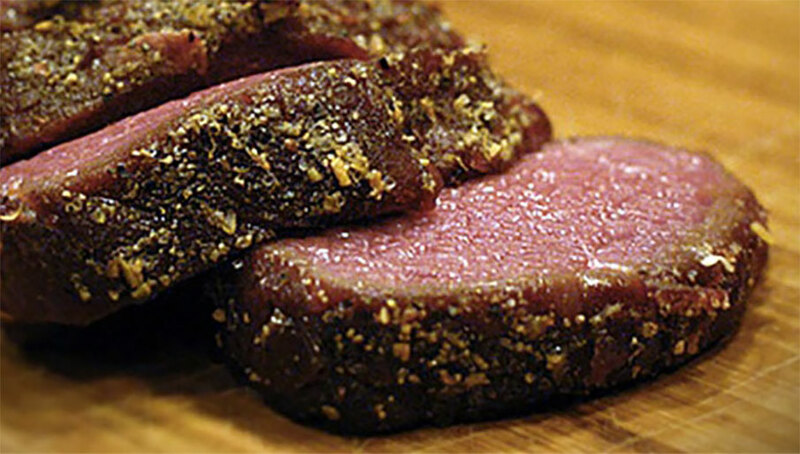 Cut elk steaks across the grain into 1/4 inch thick slices. Layer venison, sliced onions, garlic, and 1/3 cup ginger root in glass bowl. Combine soy sauce and sugar and pour liquid over meat. Cover and refrigerate 45 minutes to one hour. Heat oil and cook 5 to 6 slices of ginger root until browned and flavor is released into the oil. Remove and discard these ginger slices. Drain the majority of soy sauce from the meat and onion marinade. Add meat, onions, garlic and ginger slices to oil in skillet. Sauté two to three minutes, then sprinkle cornstarch over meat and stir. Continue cooking until meat is completely cooked. Add additional soy sauce to taste. Serves 6. Notes: Taste the soy sauce. Brands vary, and if the soy sauce is very salty, reduce the marinating time to 30 minutes.